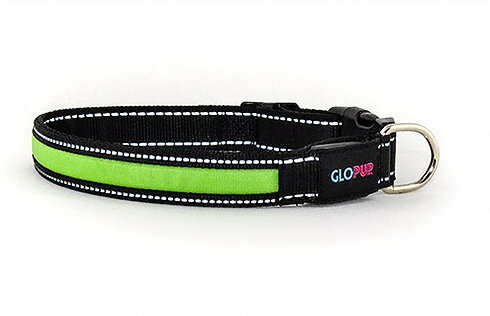 Green LED collar. Visible up to 1,000 feet away. 3 lighting modes: Quick flash, Slow flash, Steady on. Weather and water resistant. Highly durable, comfortable polyester webbing. Reflective stitching provides added reflectivity. Stainless steel latch. Two 3V lithium batteries included. Collar measures 12-14" and fits dogs up to 24 lbs.